On most days of the year, Bengalis are the laid back kind, avoiding impulses, planing vacations months ahead, reading newspapers, listening to music, and staying indoors. During Durga Puja this gets turned on its head. 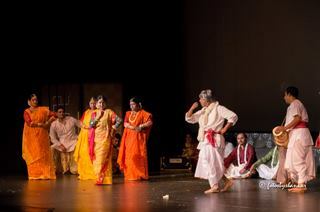 And yes, thousands of miles away from the homeland, Atlanta Bongs showed the same fervor at the Durga Puja organized by the Bengali Association of Greater Atlanta. Durga is worshipped all over India during this time of the year for nine days, each day dedicated to one of the nine forms of the goddess. Amongst Bengalis, the celebration starts on Mahalaya, the first date that marks the beginning of Devi Pakshya and the end of Pritwi Pakshya. 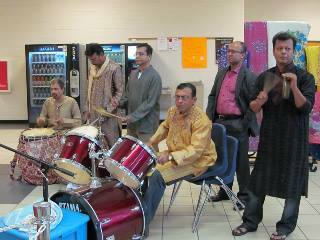 BAGA celebrated this occasion with puja offerings to our ancestors and invocation of Goddess Chandi who is the vestibule of power or shakti, at East Roswell Community Hall on September 27, 2014. 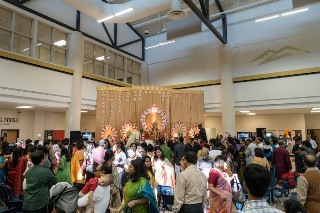 The “NRI puja” as we call it is always on the weekend, and on the weekend of October 3, 2014 over 700 Bengalis gathered at Mountain View High School in Lawrenceville to celebrate BAGA Durga Puja. Friday evening is when the bodhan or the awakening of the goddess begins with the puja traditionally offered on Shashti or the sixth day of the lunar phase, Saturday sees the next two days, Saptami and Ashtami, and Sunday the next two, Nabami and Bijoya Dashami. The ceremonies go on all day with the sounds of the dhak and the kansar ghanta, two instruments that have been the hallmark of Durga Pujo. Naivedya and bhog is offered, pushpanjali mantras chanted, aratis performed as devotees pray to Ma Mashishamardini or the slayer of the buffalo monster Mahishasur, celebrating the final victory of good over evil. The Durga Puja is as much a social celebration as it is a religious one. It is the time for new clothes, scrumptious eats, and uninterrupted adda. BAGA certainly catered to all those needs and more. Vendors displayed sarees from every corner of India and Bangladesh, and women flocked to jewelry stores. The Baga Youth Committee continued selling street foods such as phuchka and jhal muri all day. The food on these three days catered to all taste buds with paneer, dhokar dalna, tandoori chicken, chicken 65, pizza, fish curry, and the can’t-be-Pujo-without-this lip smacking finger licking kosha mangsho or mutton curry in addition to the khichudi bhog, labra, and chutney that’s always a must! 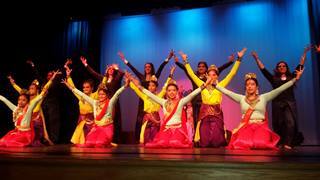 On the evenings, entertainment took center stage. Acclaimed artists from India, Debashish Chakravorty, Iman Chakravorty, and Pratik Choudhury performed their magic of poetry and music into the night amidst resounding applause and had the audience captivated and most times on their feet, dancing. 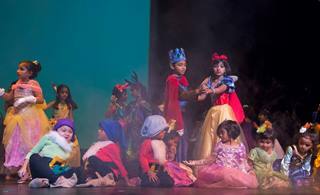 Not to be left behind, over 45 children ages three and up took stage on Saturday in “Disney’r deshe,” a medley of four classic Disney stories interwoven with characters from the Wizard of Oz. The next in-house presentation was “Shakti Rupena,” an array of dances depicting not just the physical form of the goddess, but the power or the shakti that it embodies. 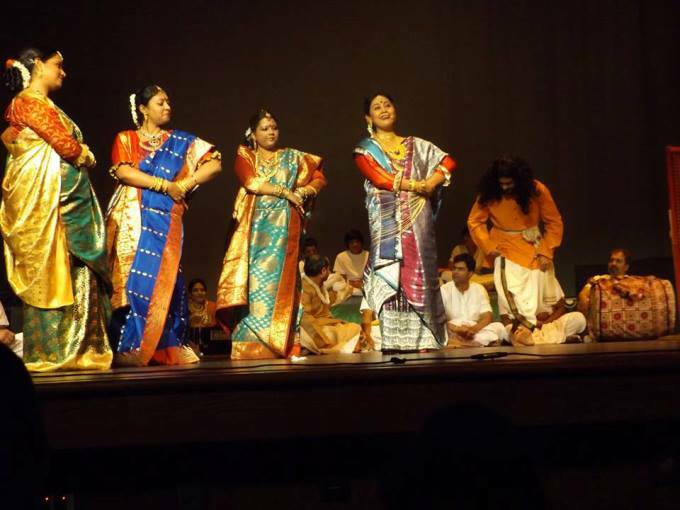 The last BAGA production was “Kobi Kahini,” a tale of poets from the undivided rural Bengal of the 1820’s that brought back the haunting lyrics and musical traditions of the pre-Tagore era. 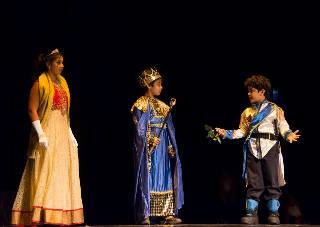 Older Kids Program "Shakti Rupena." 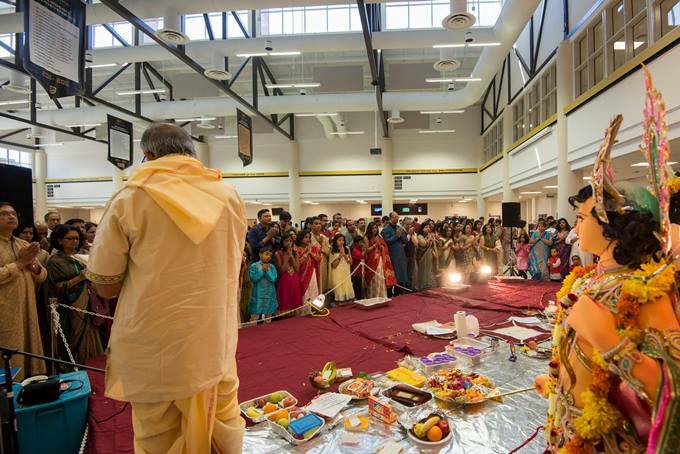 The festivities came to an end with Lakshmi Puja held on October 11, 2014 at East Roswell Park Community Hall, leaving Bengalis reminiscing and reliving the last three weekends of food, fun, and friends, eagerly awaiting the return of the goddess next year round.